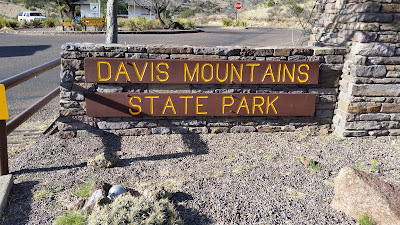 Five miles west from Fort Davis along Texas 118 is the turn off to Davis Mountains State Park, where I headed after touring the Fort Davis National Historical Site. Constructed by the Civilian Conservation Corps (CCC) in 1933 the park was opened in 1938 and occupies 2700 acres at elevations of 5000 - 6000 feet. Campground facilities weren't added to the park until 1967. 5200 feet. 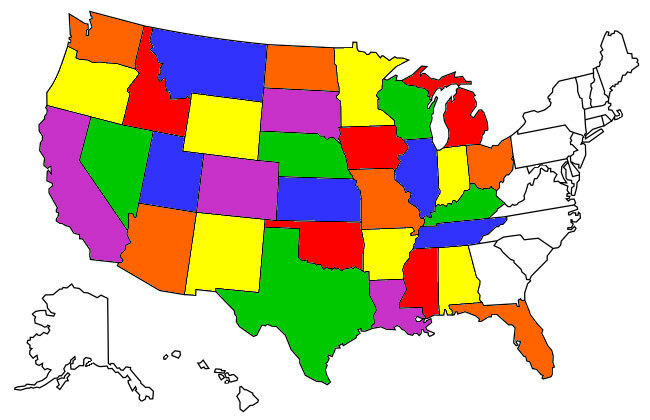 Who would have guessed in flat old Texas? 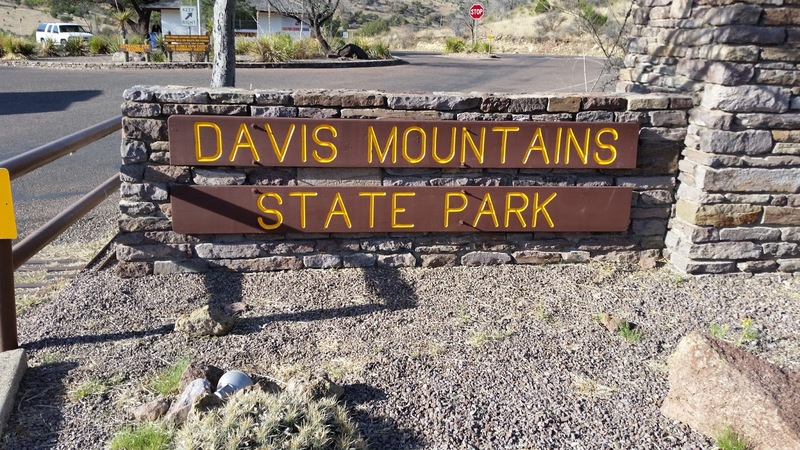 94 campsites are nestled into a small valley between to sets of large foothills at Davis Mountains state Park. I got assigned to one that was shaded by a huge live oak tree. 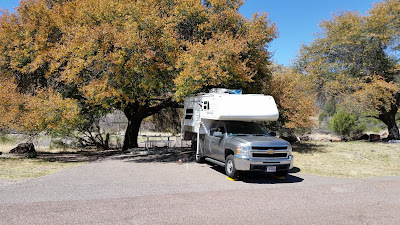 When I got my camp set up and checked Verizon internet reception I found there was absolutely none, even with my signal booster, given there was a large mountain between me and the cell towers in Fort Davis this wasn't surprising. I'm not sure this was the reason but the park actually had usable from campsite free wifi unlike every other Texas State Park I've visited to date. You couldn't stream Netflix but it was more than adequate for email and casual surfing. Note the Wifi antenna on the roof of the Interpretive Center. 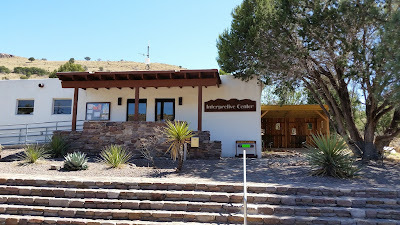 The Interpretive Center was close enough to my camp to allow me to access it's wifi antenna. The Center contained displays of local wildlife and a video loop about the park projected on a big screen TV. 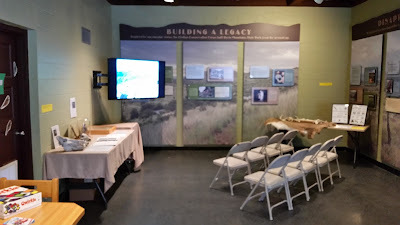 The mini-museum within the Interpretive Center. The park has several miles of hiking trails and seven miles of equestrian trails in a special section north of Texas 118 (most of the park is south of 118). 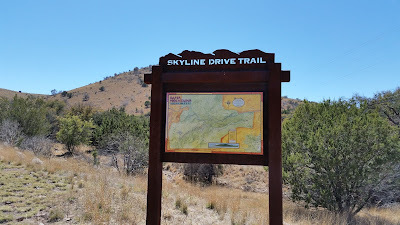 Sign at one of the trail heads. There is even a trail that goes all the way from the park back to the visitor center at the Fort Davis Historical Site but it looked like about a 10 mile round trip so I passed on taking it. Davis Mountains State Park is one of the quietest Texas State Parks I've stayed at. The three days I stayed there had almost ideal sunny temperatures. Again, it's one of those places you don't end up in unless you set out to go there in the first place but, combined with a visit to Fort Davis Historic Site, would make a great four or five day outing.